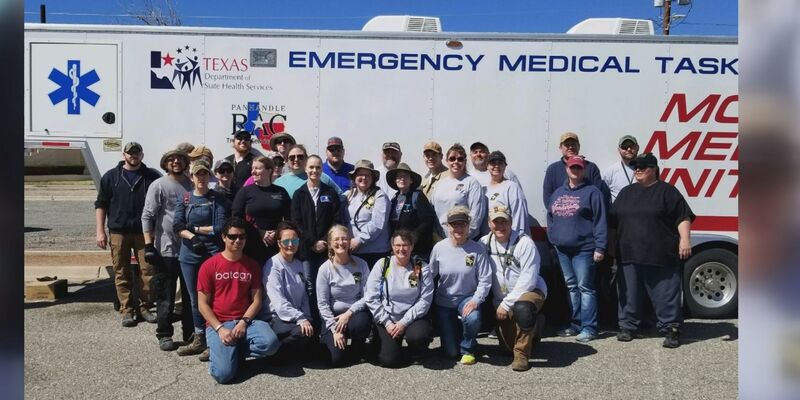 AMARILLO, TX (KFDA) - 38 Texas Panhandle Emergency Medical Task Force members have marked off year eight of providing medical services at the Bataan Memorial Death March in southern New Mexico. Since last year, the Emergency Medical Task Force 1 has provided the largest mobile medical unit at the march. This year, around 8,000 people participated in the march and medical officials treated almost 500. After days of training and preparing, medical personnel provided care to active duty, retired military, wounded warriors and civilian marchers. “I’m able to go with these amazing people that come from all over the Panhandle and now we’re all together,” said Emergency Medical Task Force 1 Supply Unit Leader Emily Nolte. For 26 miles through the desert of White Sands Missile Range, marchers can suffer from critical injuries, blisters, dehydration, hyperthermia and hypothermia. Through the rain, wind and snow, the Mobile Medical Unit said they were prepared for anything. The task force’s efforts did not go unnoticed. “We actually had the colonel come up to us and tell us that the Bataan will not happen without us being there,” said Hunt. “It was quite a compliment and it’s just one of those opportunities for us to give back. It’s really neat." You can see more pictures and videos from the White Sands Missile Range Bataan Memorial Death March on their Facebook page.